How amazing must this have felt for Cole Sager? So 17.3 has been announced. No dumbells this time. Instead, it's a couplet of chest to bar pull ups and squat snatches. The head-to-head-to-head between Sager, Fraser, and Panchik was fun to watch. Early on, though, Panchik and Fraser started pulling away and leaving Sager behind. They both finished the workout within the 24 minute cap. But for me, the best moment of the workout was in the last 30 seconds of Sager's 24 minutes. He kept failing 265# and in the last few minutes you can hear the huge crowd cheering him on. Goosebumps. Finally, it was the last 15 seconds or so and he had only one more chance to make the lift. And he did! Looking at the image, you can almost hear the crowd explode. Sager went on to get in I think a couple CTB pull ups or so after this. Amazing. I guess this is why he's called "The Comeback Kid." And this moment reminded me of that clean speed ladder event in the 2014 Games when Lauren Brooks was able to save her clean even though she'd gone on one knee. And also that time at the Games last year when Josh Bridges went on to complete the squat clean ladder. So even if I'm not as obsessed about CF as I used to be, it's moments like these that remind me how proud I am to be part of such a community. In the CrossFit world, Christmas comes three times a year: in March when the Open starts, in May when the Regionals take place, and in August when the Games is held. Already, we're done with 17.2. It's been a fun two weeks. The workouts aren't, of course, but it's the anticipation and excitement of waiting with bated breath for Dave Castro's announcement that make participating worthwhile. By participating, I mean just doing the Open WODs with boxmates and not actually signing up at the Games website. 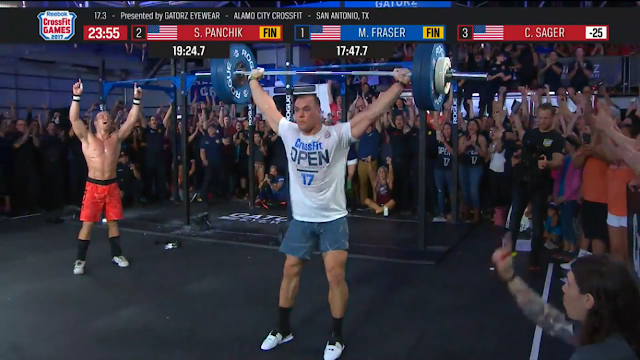 Tomorrow at 9 AM Philippine time, I get to watch the 17.3 throwdown between Cole Sager, Mat Fraser, and Scott Panchik. Gunna be gooood! Meanwhile, here's some Dan Bailey for everyone.